Don't miss taking shots such as when you are still in salon. It is every bride’s dream to look and feel stunning on that special day. You are not looking for a miracle, but looking and feeling good is paramount on your wedding day. It helps boost your self-esteem and puts a spring in your step as you glide down that aisle towards your dream future. But before taking your vows, take a look at our list of useful dos and don’ts. Don’t go on a crush diet in a bid to lose those excess kilos before the wedding. It will leave you looking weak, pale and waif. Jackie Agaba wanted to lose a few kilos before her wedding day so she took to skipping meals and developed ulcers in the process. Do not over exercise before the wedding. The extra pressure may not be good for the heart. You do not want to faint just as you are uttering the two all-important words: I do. If your skin is not oily, opt for a glow instead of the powder as it may leave you looking chalky and pale in the pictures. For oily skin, stay away from creamy products that will enhance the glow. Instead, powder may be the perfect choice. If you develop a pimple or a zit just before your big day, keep your hands away from your face – the spot will heal more neatly if you leave it alone or just squeeze some lemon juice onto it to dry it up. Don’t use a lip liner much darker than your lipstick to define your lips. (The colour should be darker but not overly so) This technique looks harsh and very unnatural in pictures. Be careful when using foundation especially on the neckline as it can stain your dress. For healthy skin, eat lots of fruits, vegetables and drink even more water well ahead of D-day. The vitamins in the fruits will leave you looking healthy and glowing. If you have hairy skin, and you are going to wear a sleeveless dress, make it a point to wax your body, especially your arms. Well, this one sounds obvious, but we feel it deserves emphasis. Use the bathroom just before the ceremony. You know why, of course. Planning a wedding is no simple matter, so at the end of it all you will be stressed out and this will show. Try to get away from all the bustle and have enough rest. Most brides worry a lot how perfect everything else looks and less how stressed out it will make them. To be that radiant smiling bride, you have to invest in some good sleep and rest. Treating yourself to a massage days before the wedding is another great way to get relaxed. A good massage helps to ease the tension and pressure that has been building up in preparation for the day. A good massage ranges from Shs35,000-Shs80,000 depending on where you do it. Get yourself looking fresh, vibrant and vigorous. Oil may be a precious commodity in the rest of the word but it has no place on your face. Avoiding alcohol, caffeine, sugary and fried foods can help as these foods can increase the production of oils in the body. But having a good skin starts with the basic principle of washing the face. Invest in cleansers like Tea Tree Oil that will penetrate and cleanse the pores without irritation. But what about if you are eating right, cleansing, but still have acne and shiny skin? Never fear, some beauty products are great with oily skins. Buy a product that will not cause your skin more oily problems. A facial is recommended two days before the wedding to give the bride a glow especially because she will be looking stressed. Dina of Christina’s Bridal Salon says the effects last seven days so you will still look as radiant on your honeymoon. 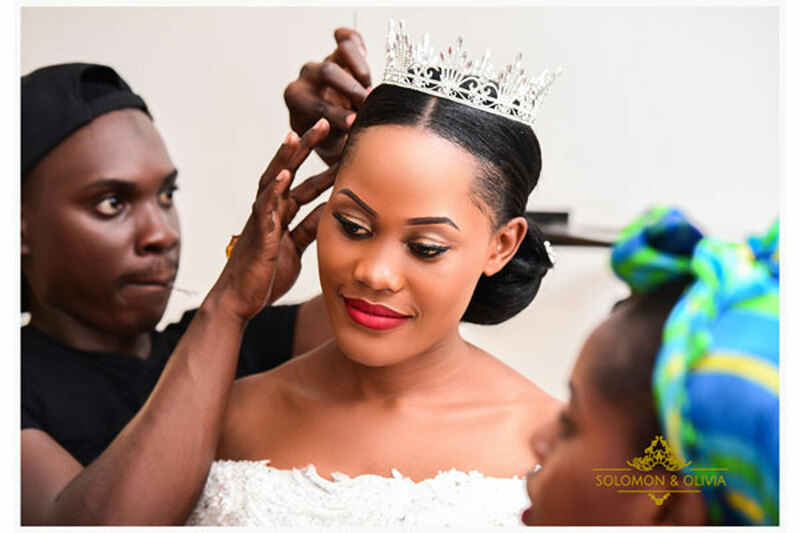 However, Maria of a bridal saloon in Kampala says she always advises the soon-to-be bride to start facials 2-3 months before the wedding. This provides ample time to heal the face in case the bride has a sensitive skin that may get affected by the facial. Okay, so oil has no place on your face but a dry skin is equally not a welcome sight. What to do? Mix 2 tablespoons of honey with 2 teaspoons of milk. Smooth over face and throat. Leave on for 10 minutes. Rinse off with warm water. Drink at least one-and-a-half litres of water every day to retain the hydration rate of your skin cells. Eat a balanced diet including fresh fruit and vegetables. If your hair is coloured, permed or treated, have it done at least one month before your wedding date. The extra time will soften your style a bit, so it looks more natural. Also, should disaster strike, you will have time to fix it. Don’t get your hair done too early on your wedding day, or it may be messed up by the time the function begins. Get a trim a few weeks before your wedding date to eliminate split ends. Most importantly though, be true to yourself. Don’t go over the top – it will just leave your guests wondering who that chick in the white dress is. When Agaba went to do her wedding hair, the hairdresser persuaded her to put on a weave/hairpiece because, according to her, all brides wore them on the big day. Jackie would not hear of it. Needless to say, she walked down the aisle, confident in her own skin, or is it hair. However, Dina recommends that it is best for brides who have very thin hair to do a weave-on. The reason, she says, is because “the veil tends to fall flat on the head since the hair has no real body to lift the veil up, hence ruining the pictures”. If your veil needs to be removed after the ceremony, make sure your hairdresser shows your maid of honour how to do it without mussing up your ‘do. You can have the softest lips and the perfect lipstick, but if your teeth are yellow, you won’t want to flash a smile. There are lots of safe, reliable over-the-counter teeth-whitening systems. Teeth whitening can be done at dental clinics in Kampala. Pay up. You will not only have a glistening smile that day but forever. You have your strong points. Be certain to highlight and enhance them. Make them stand out. This will make you feel good and confident about how you look even if you may not look like a movie star. Finally, you do not want to walk down the aisle smelling funny. Dab a touch of perfume on your skin and go dazzle.